Wild dogwood trees in North America are beautiful flowering species, most easily identified when they are in bloom. Many people have the ability to recognize the flowering dogwood (Cornus florida) that grows through much of the eastern United States. However, multiple species of dogwood occur in different parts of the country. Identifying these trees often depends on your powers of observation to assorted details concerning their traits. The dogwoods usually are a multiple-stemmed tree with a spreading crown. Dogwoods typically are small. The Virginia Department of Forestry web site says that a gray dogwood, for example, rarely exceeds 10 feet in height. The flowering dogwood grows to maximum sizes of about 30 feet, notes the “National Audubon Society Field Guide to Trees.” The trunks of dogwoods are in proportion to their height; few are more than a foot in diameter. 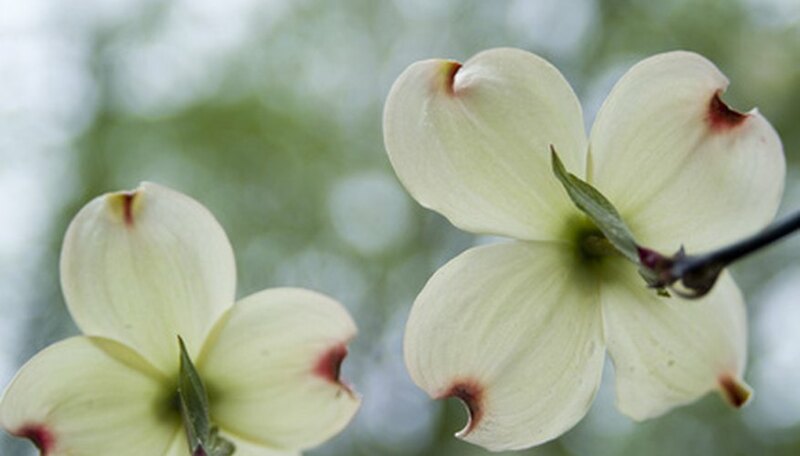 The flowers of some dogwoods often confuse people, as the parts that garner the most attention are actually a modified type of leaf known as a bract. The bract is showier than the actual flowers, surrounding the smaller flower heads and looking like large petals. The bracts attract the pollinating birds and insects to the dogwood trees. Some dogwoods have clusters of flat-topped flowers, not at all like those of flowering dogwood. These types include red osier dogwood and alternate leaf dogwood. By knowing the geographic distribution of certain dogwood types, an individual can enhance her chances of identifying the species. The red osier dogwood has a huge geographic range and can found in eastern parts of Canada and the northeastern United States across the continent to Alaska and California. Roughleaf dogwood grows in much of the central United States from the Great Lakes south to portions of the Gulf Coast. Pacific dogwood is a species relegated to the Far West. Alternate leaf dogwood grows in the east, often in the same regions as the flowering dogwood. Dogwood fruit often will stay on the branches for a long time, with the fruit varying in appearance between species. The flowering dogwood produces a bright red fruit that emerges in clusters, with the fruit as long as half an inch. The fruit that the alternate leaf dogwood develops is almost black, while that of roughleaf dogwood is white. Silky dogwood’s bluish fruit is ripe by the end of summer, which is the case with most dogwood species. The habitat of dogwood trees provides vital clues as to what kind it is. The alternate leaf dogwood grows best as an understory species near hardwood and coniferous forests. The roughleaf dogwood can thrive along streams and actually will form thickets of many trees at the edges of forests in some of the prairie venues in which it occurs. The red osier dogwood does best in damp soils, with the banks of streams a likely place to find one. The flowering dogwood handles moist or dry soils in valleys and upland forests. How Big Will a Crabapple Tree Get?